The truth is, I wanted to be able to write something this weekend about all that I have to be grateful for. I know there is a lot. For some reason every time I sat to write, nothing came out. Thanksgiving is a holiday that I have long loved (my dad’s birthday often falls on it) and felt conflicted about (just ask any of my Indigenous friends to explain). This year, Thanksgiving weekend was particularly hard. I could feel it coming in the days leading up to it: I was melancholy and tired. Then the tears hit. I couldn’t stop missing people who have died. I felt overwhelmed by a number of different circumstances. Mixed up with the sadness was undeniable resentment. I recently read about resentment being one of the opposites of gratitude. As I prepared to share about this idea at The Dale on Sunday, I couldn’t help but see myself in the middle of it. What does it look like to break through resentment and find freedom from its chains: the chains that prevent action, preoccupy thoughts, and propel unhealthy choices? I suspect the starting point is confessing our resentments, which is not easy. One of the things I treasure about The Dale is how so many of my friends confess so freely. There are few masks, which challenges me to remove mine. So, through many tears I poured the hardship of the weekend out to Dion and then again at The Dale. In that act I felt heard, which in turn helped me feel less alone. Not news, but it turns out carrying resentment is very…human. There is a space created for understanding, forgiveness, and grace when we confess. In turn, we are freed to develop a new spirit of gratitude. The act of gratitude takes practice, almost like working a muscle in order to make it stronger. I acknowledge there are many things to be thankful for, even in the midst of great struggle. If I’ve learned anything over the years, it’s that the seemingly “little” good things in life are actually very big and definitely worth noting. Resentment is hard to hold on to when there is a burgeoning spirit of thanksgiving. I’m still tender. A serious wave of grief hit, and it has yet to break entirely. There is a lot about life that is hard, for each of us, in so many different ways. It is impossible to make sense of it all. What I believe is that life is a gift. I choose to believe that all things will ultimately be restored and made right. In putting away my resentment, I get to sing a new song, a song that can be sung everyday. Even on this Thanksgiving weekend. I had just finished a session with my therapist and was entering the subway to head home. The station (or more accurately, the building that it is housed in) was under some major construction and erected some temporary, metal stairs. An elderly woman was next to me, carefully holding the railing and slowly making her way down. I felt the toe of my boot snag in a gap which thrust me forward into an almost movie-like fall. I tried to grab something to stop myself and nearly took out the woman in the process. I somehow managed to keep either of us from tumbling and breathlessly apologized for the accident. I will confess that I can be a klutz. I suspect this, along with being pre-occupied by all the thoughts running through my head from the earlier appointment lent to my near fall. I was also thinking a lot about my impending ordination council. The next day I would be presenting my statement of faith before a group of people who would then vote about whether or not to affirm my sense of call, not exclusively, but particularly to The Dale. I guess I felt even more anxious than I realized. I carried on with my day, only to have yet another incident. I needed a quick dinner and decided to pan fry some perogies. Somehow, and I swear I don’t know exactly what happened, I managed to spill hot oil onto my hand. It left splatter marks and one sizeable blister. This was not helping my nervousness about the next day. After my ill-fated supper, I went to an event at Cate’s school which was a good distraction. Later in the evening I felt relieved that I was tired enough to go to bed at a reasonable hour, hoping I would sleep well. In the early hours of the morning I was suddenly awoken by…my reading lamp, affixed to the wall since 2001, FALLING ON MY HEAD. I kid you not. The light bulb even broke, leaving shards of glass on my pillow. I thought, this is either a bad sign or everything terrible that needed to happen is now out of my system and today will be fine. I hoped it was the latter. Thankfully the ordination council proved to be a beautiful time of encouragement. All of my anxiety melted away as I told my story of faith and journey with The Dale, explained my philosophy of ministry and theological views, answered questions, and was voted (unanimously!) to be ordained by the CBOQ. I felt surrounded by the community that presented me for this process, which made it not my day, but OUR day. And the truth is, after a year of too many deaths, struggles and heartache, it was good to have something worthy of celebrating together. In a weird way, I’m even grateful for my series of misfortunate events. The fall, the burn, the lamp all reminded me that I am a frail being. Whether I managed to steady my feet on those subway steps or not, God is with me. It is God who has invited me into my role at The Dale. In humility I want to be a leader who serves and loves people, albeit a klutzy one. I am thankful for the affirmation of my peers. I really can’t imagine doing anything else. Today I rose early to walk with a friend. The air felt good as the sun started to rise. When I got home I sat on our porch swing, one of the few things I always knew I wanted when I imagined one day maybe having a house. For some reason a free newspaper landed on our stoop and so I looked at it. I remembered to cut the two peony blossoms from our garden so that we can enjoy them for a little longer as they perfume the living room. Now I’m drinking coffee and eating peanut butter on toast, both things I could easily have for breakfast every day. The birds are singing. The sun is now high enough to splash on my face. Every once in a while i catch myself sighing. The burden of the last while has been heavy and I’m attuned to the fact that I’m weary. When I get to this kind of place I try to remember that being present to the moment is helpful and good. This morning is about that. Hopefully the rest of the day will be too. 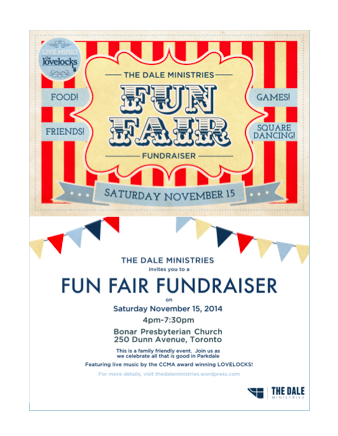 On Saturday The Dale is hosting a big event that we’ve dubbed our Fun Fair Fundraiser. A lot of planning has gone into this. Like, A LOT. Most of it done by a team of people, namely Ben and Gen (I just realized their names rhyme). They have brainstormed, made lists, produced written material, found donations, the list goes on. I’ve never experienced having a duo like them do so much for an event like this. Hannah is a woman bringing her food prowess to the kitchen so that people can purchase something savoury or sweet. It’s a big job and she’s taken it on. This, after just completing a large event last weekend. Megarrah is producing banners for each game stall. The Lovelocks are coming, despite a busy day for them. John and Tom are doing the sound. The square dance caller is booked. Sean is willing to sell drinks. Melody and Michelle are making pie. Wanda’s Pie in the Sky, a shop in Kensington Market is rounding out the pie auction. Our core community is rocking it too. Our regular kitchen team is showing up early Saturday to help Hannah. Terry, a former professional sign maker is busy at work for us. Tim designed the invitation. James wants to sell his art so that he can be a part of keeping this place going. I can’t tell you how many people have said, “I’ll do whatever you need me to”. Our Board of Directors will be face painting, taking pictures, setting up bales of hay and doing whatever else they can to help. Joanna is doing such a variety of things for Saturday that I don’t know where to start. I have no idea what I’d do without her. I couldn’t do any of this without Dion and Cate, who are present, helpful and so encouraging about The Dale in general and about this event specifically. Cate is assisting me in making props for the photo booth and is sure that if we have enough moustaches on sticks everything will be well. Each time I see that a friend has shared the invitation or hear that someone is sending a donation or discover that someone is able to come I am thankful. The Dale works because of what I’ve described above: it is a community of people, both at its core and more broadly that fully participates. It’s during a week like this one that I find myself overwhelmed with gratitude at that reality.